This is a wry, witty look at how humans create mythologies. The title series of poems creates a year-long cycle of urban moons, named for objects in the city environment – just as any hunting and gathering culture has named the moons of the year for objects important to it. The collection also includes the sequence, Scenes from the Sugar Bowl Café, which won the Canadian Poetry Association’s Shaunt Basmajian chapbook contest. 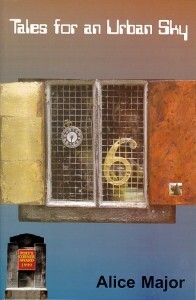 The manuscript won the Poets’ Corner Award, sponsored by Broken Jaw Press, in 1999. It was also a finalist for the City of Edmonton Book Prize and for the Alberta Writers Guild’s Stephan G. Stephansson Award for Poetry. Beautifully told tales of the city, forming a mythology of how and why and who and where, form the core of this collection of wonderful poems. Alice Major has a clear and focused eye that pins the reference points of city living, an eye that gathers what goes unnoticed, yet forms the background of our lives. There is rhythm and richness of detail in Major’s unique style of storytelling. “And I’m tapping my foot, feeling fine. / Outside, an oriental man pulls up / struggles to fit his brown Impala / by a parking meter. Then looks for change / to rent this little space for a time. ”Tales for an Urban Sky is a collection of observations and fables, with unexpected glimpses that present a new view, a different lens. My one quibble is the terrible typeface chosen for the cover and title of each piece; fortunately, it should not deter readers from enjoying this intelligent, special book. Major’s collection of poetry casts a wide net over the diversity of urban life in Edmonton. She plays mythic space and urban space against each other in wonderfully provocative ways. – Jury comments, City of Edmonton Book Prize, 2000. These are inventive, humourous pieces that cruise the urban landscape. The book is broken into four sections, and Major has great fun mythologizing the modern city and its inhabitants. … This book takes a clever idea and brings it to fruition through Major’s flair for poetic narrative. Alice Major’s focus is the literary equivalent of many postmodern artists: the core of a large city. Out of its barrenness and ugliness she creates a cluster of myths, which, in her own words, are “about possibilities of an ideal world and the gaps between that world and the mundane.” With her ability to forge stunning metaphors she has created one of the most imaginative collections of poetry to be found anywhere. In so doing, she makes the world where generations “have emerged and died/ with no glimpse of galaxies” an exciting and almost inhabitable place. This collection features brilliantly inventive, funny and poignant myths. In the titular sequence every one of these narratives satisfies the child’s desire for a clear-cut tale, the city-dweller’s hunger for legendary aetiologies to equal those that dignify the countryside, and the adult’s love for a good mix of intellect and humour. Copies can be purchased through the Broken Jaw Press website.